A typical family outing Saturday turned into a touching reunion for a military family in San Mateo County. What started as a typical family outing Saturday quickly turned into a touching reunion for a military family in San Mateo County. 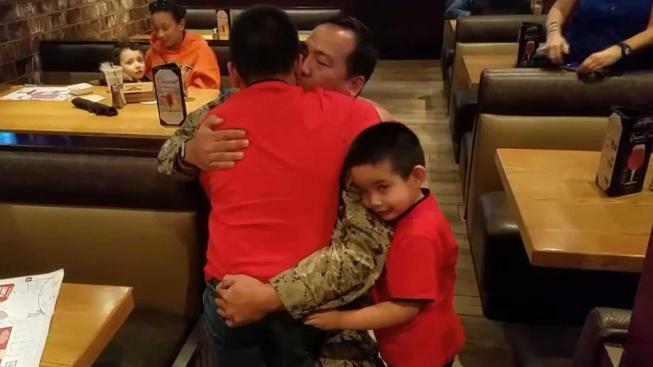 Petty Officer Roberto Tapiador, with the U.S. Navy, found out he was coming home for Christmas just in time for the holidays. So he decided to surprise his two sons. Tapiador's wife played along, taking the boys to a BJ’s Restaurant in San Bruno for lunch. The children unaware that their father was waiting for them in the kitchen. Needless to say, it was an emotional experience when Tapiador, acting as if he were a waiter, delivered his family’s food to their table. "Dada!" Giancarlo Tapiador, the officer's older son, exclaimed, trying to grab the food out of his father's hands and set the plates on the table. Roberto Tapiador's younger boy jumped up to give him a hug, allowing his father to lift him up. Giancarlo, however, covered his eyes and broke down. Roberto Tapiador pulled him into his arms and hugged him as claps and whistles broke out in the eatery. “I was like so emotional,” Giancarlo said later. “My heart is just so touched." Tapiador will stay home in Daly City for eight months before returning overseas to East Africa, where he is stationed. “Missing birthdays is bad enough, but missing Christmas would be a down moment for us,” Roberto Tapiador said.